The closest train station is Füssen it is approximately 5 km to Hohenschwangau, which is where the path to the castle starts. From the station you are able to catch a bus to Hohenschwangau. From the village of Hohenschwangau you can either go by foot, horse drawn carriage, or bus up the mountain. Drive the Autobahn A7 direction Ulm-Kempten until the exit Füssen. At the exit drive in direction to Schwangau/ Königschlösser (Royal castles) to the federal road B16. From Füssen city drive into the federal road B17 direction Schwangau and follow the signs to Hohenschwangau village. Nearest Airport: Munich which is approximately 155 km from Hohenschwangau. You can reach Hohenschwangau by taking a combination of tram (to Munich central station), train (to Füssen), and bus (to Hohenschwangau) or by driving. It takes approximately 3 hours depending on connection times. One of the most visited castles in Germany and one of the most popular tourist sights in Europe the Schloss Neuschwanstein is a symbol of romantic architecture and the story of the life of Ludwig II. Resting on top of a hill in the Alps, overlooking the Hohenschwangau valley, Neuschwanstein is pure beauty. Building of the castle begun in 1868 and what was once built as a personal refuge for Ludwig II of Bavaria was opened only 7 weeks after the king’s death in 1886 to the public. The king died before the completion of the castle in 1892. The architect depicts romanticism and Ludwig II’s great enthusiasm for the operas of Richard Wagner. Ludwig foresaw his showpiece palace as a giant stage on which to recreate the world of Germanic mythology. Huge wall frescos depict scenes from the opera "Tannhäuser", incredible mosaic floors containing over two million stones, a gaudy artificial grotto and many more fairytale alike architecture is awaiting you here. The castle is really advance of its time although looks medieval on the outside the castle was built with state of the art interior, such as central heating and running toilets, as well as hot and cold water. Enjoy beautiful scenery and take the hiking trail to Marienbrücke. A 20 minute walk from the Schloss Neuschwanstein, the bridge, named after Queen Mary, Ludwig II’s mother, over looks the gorge and the Poellat waterfalls as well as gives you amazing views of the castle. Enjoy sightseeing at the beautiful nearby villages such as Hohenschwangau and Füssen. There is also the Hohenschwangau castle which King Ludwig II spent his childhood in Hohenschwangau. The Museum of the Bavarian Kings and dinner by the romantic Alpsee are popular activities for every visitor. Just 2 km from Castle Neuschwanstein, the Luna Mia offers well-equipped apartments with free Wi-Fi and free parking spaces. They are located in the quiet Horn district of Schwangau. These apartments are located directly next to the scenic Forggensee Lake, just 14 km from Neuschwanstein Castle. Ferienhaus Schnöllerhof offers a sauna with lake views and a garden. 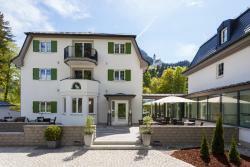 Newly opened in December 2012, this 4-star hotel is set directly beneath Neuschwanstein Castle and is located 3 km from Füssen. Villa Ludwig Suite Hotel has its own spa area including a Finnish sauna, steam bath and relaxation room.